Our marketing strategy primarily revolves around SEO work and getting our site to rank in search engines. A primary component of this is blogging. To hit the ground running, we are planning on releasing blog posts at least once or twice a week. If you would like to contribute to our blog, you can contact us to discuss writing a post that would be hosted on our site. Being a guest blogger on SacWellness is a great opportunity for you to be seen by potential clients and by your colleagues! 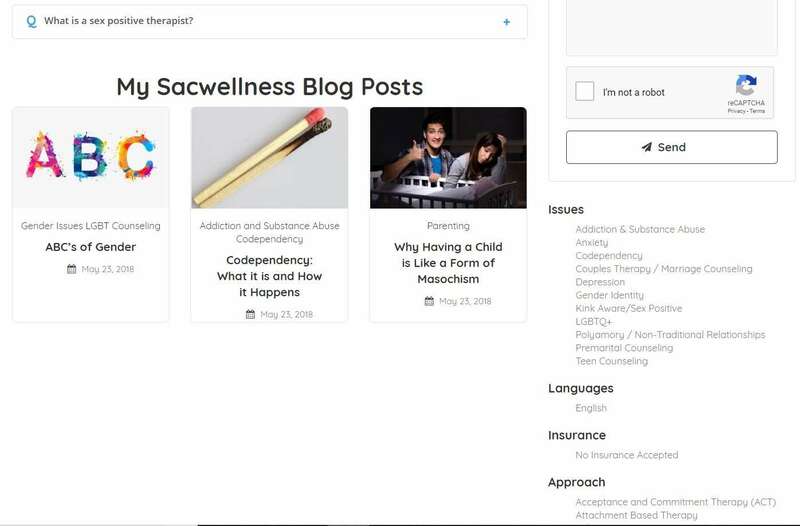 posts shared by guest bloggers will be kept in the blog section of SacWellness and will be displayed on the homepage right underneath the featured therapists section for 20 days. Your post will also be included in our social media advertising for 5 days. The last time this page was updated (12/19/18) we were averaging around 171 views for guest blog posts in the first five days of them being published. Having your blog post featured on SacWellness will provide your site with more quality backlinks that can help boost your search engine rankings. Learn more about this in our post: How SacWellness Can Help Your Search Engine Rankings. Writing a guest blog can improve your SacWellness listing and help potential clients see more of what you are about. When you write a guest blog post it will appear at the bottom of your SacWellness listing, where potential clients will find it when viewing your listing. If you would like to write a post for SacWellness, please contact us and let us know what you are thinking to write about and when you think you might be able to submit it. Blog posts may be on just about any topic you choose as long as it is related to mental health. We don’t have any particular word length requirements for blog posts, but the most recent research we’ve read has suggested that search engines prefer posts that are 1200+ words. One of our SacWellness superpowers is that we have a college English professor on staff! After we receive your article, it will be submitted to our editor who will proofread it and make minor spelling and grammatical corrections as necessary. If our editor finds any major issues with your article she will contact you to request changes/clarification. When you submit your post please include a short blurb about yourself and your practice. This will appear at the bottom of your featured post along with your SacWellness profile photo. Links back to your website and SacWellness profile will be incorporated into this. If you have any images you would like included with your blog post, you may send them to us with your completed article. If you do have images you would like to share, we ask that you provide proof of copyright ownership. If you cannot demonstrate ownership or you do not have an image you would like to use, we will use one of our own images to supplement your post. This image is what will appear in the thumbnail and at the top of your post on SacWellness. If you’re wondering, We get most of our images from Shutterstock.